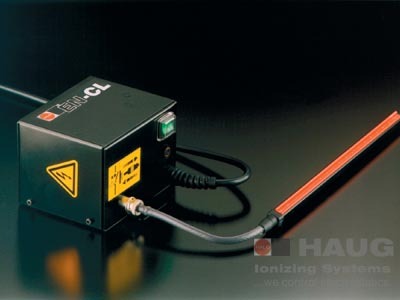 The ionizing bar can be easily mounted without tools by means of a bayonet catch (quarter-turn fastener). This HAUG ionizing bar is highly effective, safe to touch and particularly well suited for mounting in places where there is little room. This HAUG package applies to electronic data processing machines as well as to printing, cutting, folding, label manufacturing, and other paper processing machines. These combined devices are also a perfect production aid in the film and foil processing industry.